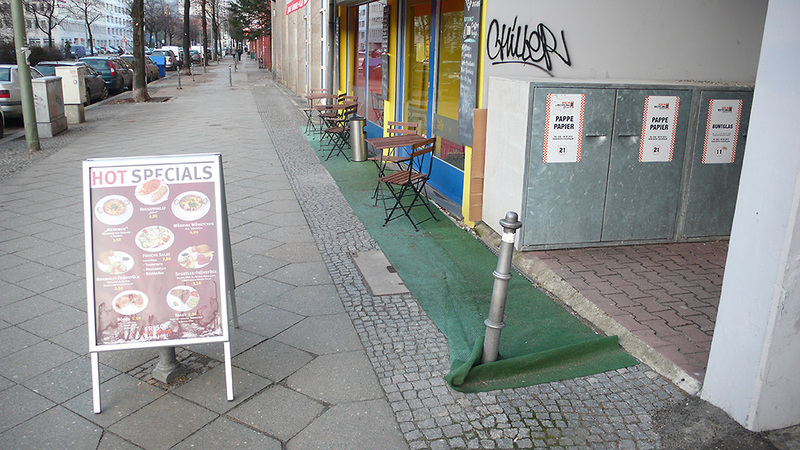 Back after a four year hiatus, Astroturf Gemütlichkeit presents “Hot Specials” from half-way up Lindenstraße, just before you hit Mitte, in the bit where Kreuzberg sidles away like a scorned dog and you’re left adrift in the incoherent urban trialogue around the former DMZ. Confusion extends to the culinary offer, which mysteriously includes a “Fresh Salad” amongst the more orthodox hot specials of “Spicy Sausages”, “Börek”, “Toast” and “Athletes Breakfast”. But fear ye not, a “Normal Breakfast” is at hand and everything is guaranteed “Fresh, Crunchy, Daily”. Which cannot be said for this woeful stretch of ’stro, which has been folded back by a measure equivalent to the stretch of cobblestones thus revealed. The chairs and tables remain neatly confined by the grassy-verge (safely zoned), but the characteristic jaunty bollard bears witness to an inadequate negotiation between flexible and non-flexible materials. Whither, Gemütlichkeit? Alas, not here. Luckily “Hotdrinks” are on offer, and you can grab your “Coffee togo”.